Garmin International Inc., a unit of Garmin Ltd. (NASDAQ:GRMN) , today announced the availability of Electronic Stability and Protection (ESP-X) technology for aircraft using Garmin’s G3X autopilot servos. This electronic monitoring and stability augmentation system works to assist the pilot in maintaining the aircraft in a stable flight condition. Available for the first time in this market, ESP-X functions independently of Garmin’s G3X autopilot system and works in the background to provide an extra envelope of protection to help avoid inadvertent flight attitudes and provide airspeed protection while the pilot is hand-flying the aircraft. Should the pilot become inattentive, Garmin ESP-X provides pilots with an added measure of protection and correction to enhance in-flight safety. When a pilot exceeds user-selected pitch, roll or airspeed limitations, Garmin ESP-X provides gentle nudges on the flight controls to lessen the aircraft’s pitch attitude or bank angle. Even further, the correcting force becomes stronger if the aircraft pitch, bank or airspeed exceedance grows further away from the preset limits. While ESP-X adds a substantial margin of safety to the wide range of flight regimes within its designed operational limits, there are in-flight situations that can exceed the recovery capabilities of ESP-X technology. As the pilot takes corrective action to reduce the abnormal flight attitude or airspeed, the influence of Garmin ESP-X eventually fades and turns off when the aircraft returns to its normal flight envelope. Conversely, should the pilot become incapacitated and the system detects it has been activated for more than fifteen seconds, the autopilot engages with the flight director in Level Mode, bringing the aircraft to level flight until the pilot commands otherwise. In addition to flight control corrections, pilots are also provided visual cues on the displays of G3X and G3X Touch indicating ESP-X is engaged. Yellow chevrons provide visual pitch guidance and configurable roll limit indicators indicate where ESP-X engages to provide bank guidance. Garmin ESP-X goes beyond providing pitch and bank envelope protection to also offer high and low airspeed protection. In a high airspeed situation, Garmin ESP-X engages the Garmin G3X autopilot servos to apply back pressure to increase the aircraft’s pitch attitude. Built-in parameters further prevent the aircraft from exceeding G-limit load factors as the pitch attitude increases. In low airspeed situations, Garmin ESP-X engages to provide a gentle pitch-down force to reduce the possibility of stalling the aircraft. Furthermore, when the aircraft is operating within 200 feet of the ground, Garmin ESP-X automatically disables. Utilizing Garmin’s G3X autopilot servos, Garmin ESP-X continuously monitors attitude and airspeed while the pilot hand flies the aircraft to provide pre-determined correcting inputs should they be needed. Pitch, roll and airspeed envelope protection parameters are customizable on the displays of G3X and G3X Touch, so pilots can select what limitations best suit their individual flying habits. For flight training or aerobatics, Garmin ESP-X can easily be inhibited within the automatic flight control system (AFCS) menu of G3X and G3X Touch or by installing an optional dedicated switch in the panel. Garmin ESP-X is available as a software update at no cost for customers with G3X and G3X Touch flight display systems with Garmin’s integrated autopilot. For additional information or to download this software upgrade, visit: www.garmin.com/experimental. Garmin’s aviation business segment is a leading provider of solutions to OEM, aftermarket, military and government customers. Garmin’s portfolio includes Integrated Flight Decks, navigation, communication, flight control, hazard avoidance, an expansive suite of ADS-B solutions and other products and services that are known for innovation, reliability, and value. 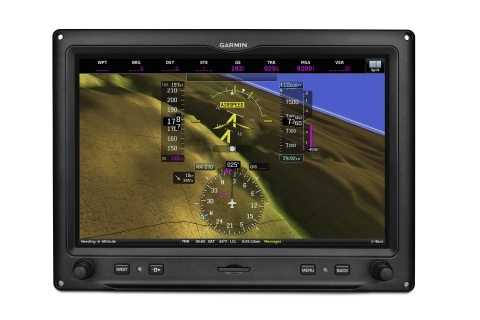 For more information about Garmin’s full line of avionics, go to www.garmin.com/aviation. For more than 25 years, Garmin has pioneered new GPS navigation and wireless devices and applications that are designed for people who live an active lifestyle. Garmin serves five primary business units, including automotive, aviation, fitness, marine, and outdoor recreation. For more information, visit Garmin’s virtual pressroom at garmin.com/newsroom, contact the Media Relations department at 913-397-8200, or follow us at facebook.com/garmin, twitter.com/garmin, or youtube.com/garmin. Garmin International Inc. is a subsidiary of Garmin Ltd. (Nasdaq: GRMN). Garmin Ltd. is incorporated in Switzerland, and its principal subsidiaries are located in the United States, Taiwan and the United Kingdom. Garmin registered trademark and G3X is a trademark of Garmin Ltd. or its subsidiaries. This release includes forward-looking statements regarding Garmin Ltd. and its business. Such statements are based on management’s current expectations. The forward-looking events and circumstances discussed in this release may not occur and actual results could differ materially as a result of known and unknown risk factors and uncertainties affecting Garmin, including, but not limited to, the risk factors listed in the Annual Report on Form 10-K for the year ended December 27, 2014, filed by Garmin with the Securities and Exchange Commission (Commission file number 0-31983). A copy of such Form 10-K is available at www.garmin.com/aboutGarmin/invRelations/finReports.html. No forward-looking statement can be guaranteed. Forward-looking statements speak only as of the date on which they are made and Garmin undertakes no obligation to publicly update or revise any forward-looking statement, whether as a result of new information, future events, or otherwise.